When we invited KAIJU! to be one of the guest breweries at the 2015 Good Beer Week World of Beer Masterclass, alongside Hawkers, Edge, Evil Twin and Baird Beer, it was this beer that we chose for their Q&A session with attendees. There was a bit of personal preference involved as it's our favourite from the brewery's lineup, while it was also coming off the back of a gold medal at the Craft Beer Awards. What we didn't realise until the Q&A is that it's also the least hoppy beer they brew. That said, this being KAIJU!, it's still pretty damn hoppy. Sure, it looks like a dark porter, but you don't have to get that close to realise it's not as a blast of herbal hops hit you first. 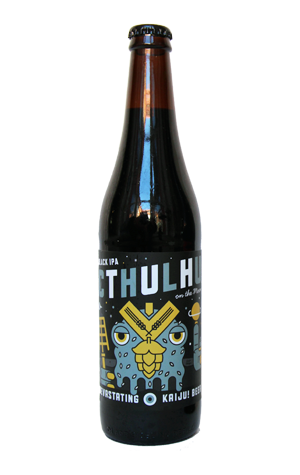 They share the limelight with characters more typically expected of a beer of this hue: roasted malt and coffee, and do so in a manner that's well judged enough that the beer collected another gold at the 2016 Australian International Beer Awards.